70 down, about 10 to go. Weight this morning was 191.0 pounds. Yesterday was 191.3. Not much exercise at the moment, but something of a renewed commitment to sticking to calorie goals and not allowing those extras. When I can exercise, it’s largely been aerobic. Scary to think that in less than 10 pounds, I’m no longer formally overweight. As I lose weight, though, I’ve been less and less affected by gout symptoms. Diabetes allows some alcohol, though one glass is considered 2 fat exchanges (I get 6 exchanges a day). Is it time to break out a bottle of Anchor Steam, or perhaps find Mike Stock for a Friday at Summits Tavern? 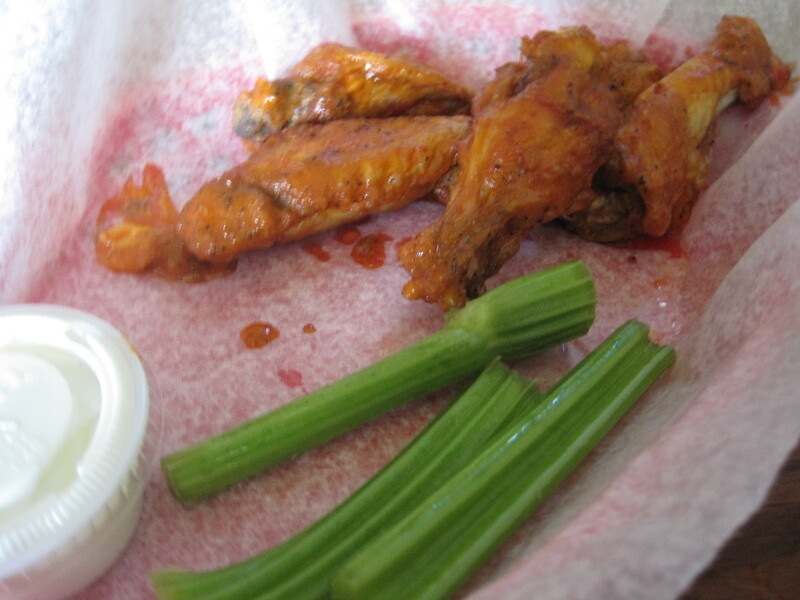 Jimmy, of Eat It Atlanta, suggested that Clay’s wings, of Clay’s Sports Cafe, were good. I’m here to say I tried them and yes, they are. 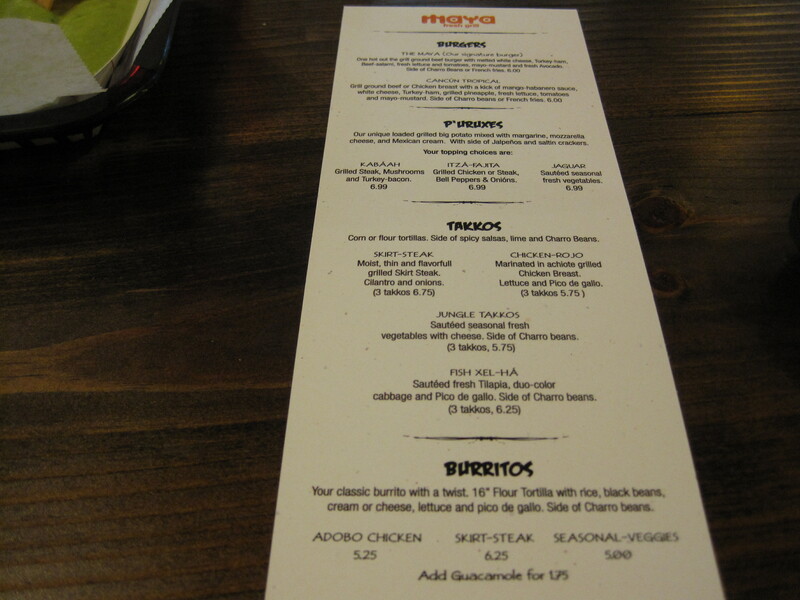 Maya Fresh Grill now has a menu. 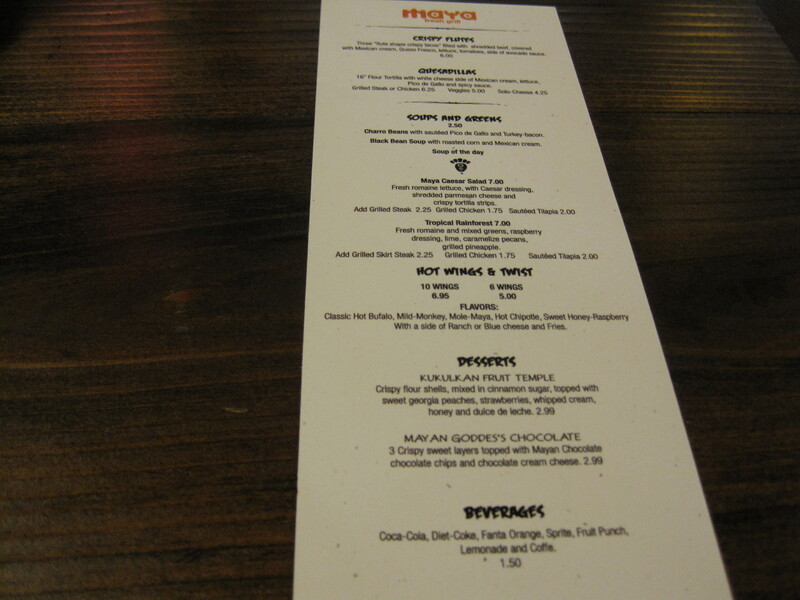 It’s a good looking menu, with an enticing list of smaller items. 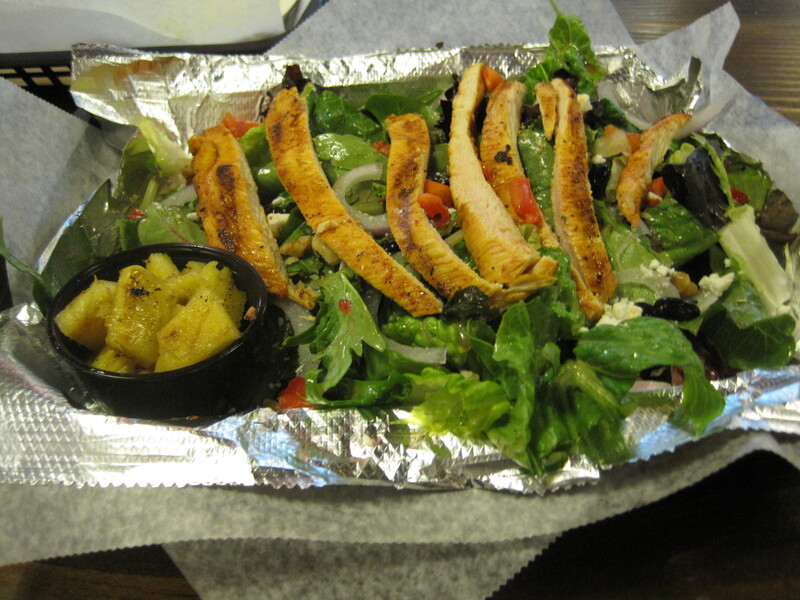 Things like takkos, quesadillas, salads, and more regional ethnic fare dot the menu. I had their rainbow salad, which was delicious. 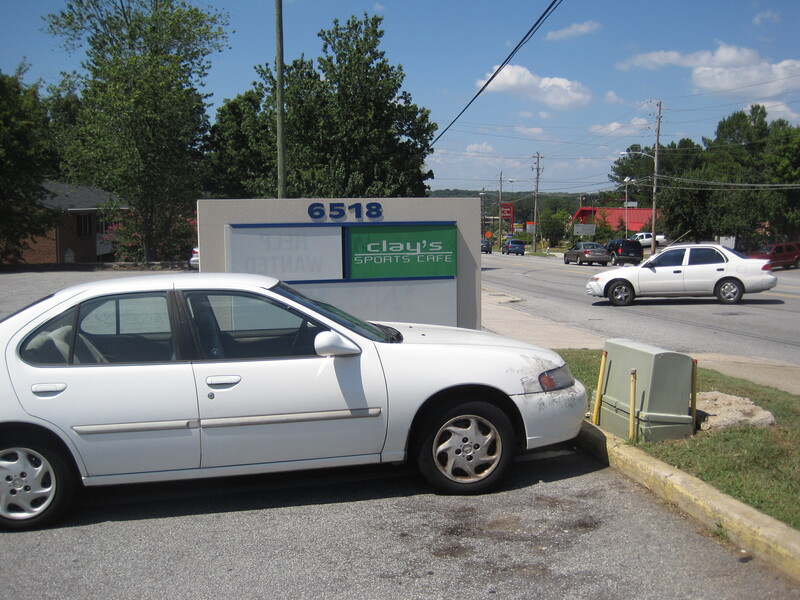 So I have to say to foodies in the Snellville area, and perhaps Chloe (if she trends out this far east): go now. Go before this place changes. It’s delightful right now, with owners in love with their craft. And if my experiences with gifted small owners is any indication, often a restaurant will grow popular and the owner disappears, or the restaurant dies and the owner is no longer around. So go. 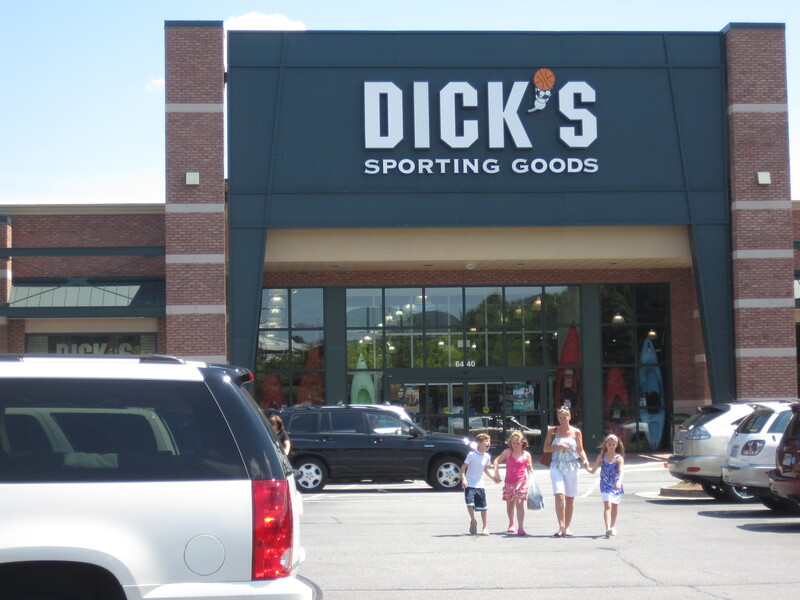 This place is worth a stop on the way from Snellville into Duluth. 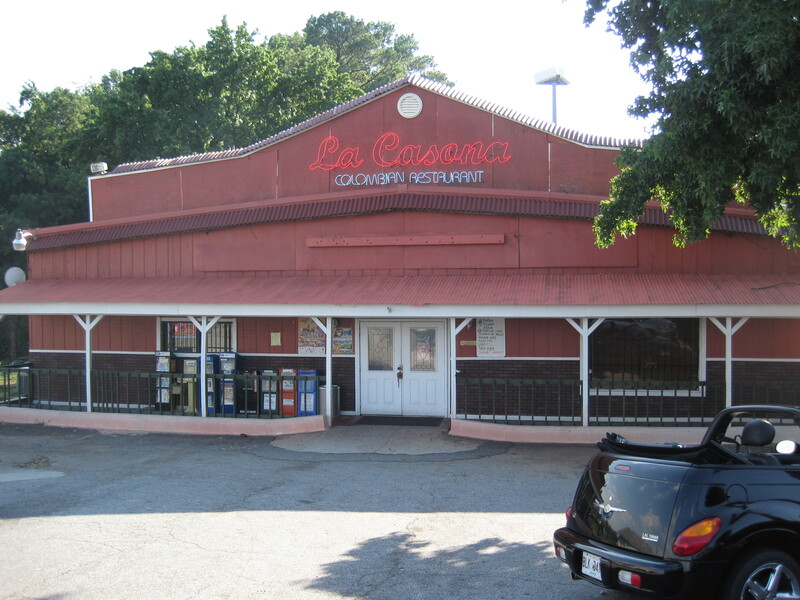 La Casona is a reasonably well known Columbian restaurant, roughly at the corner of the road that passes Brands Mart USA and the new Super H, and Buford Highway itself. 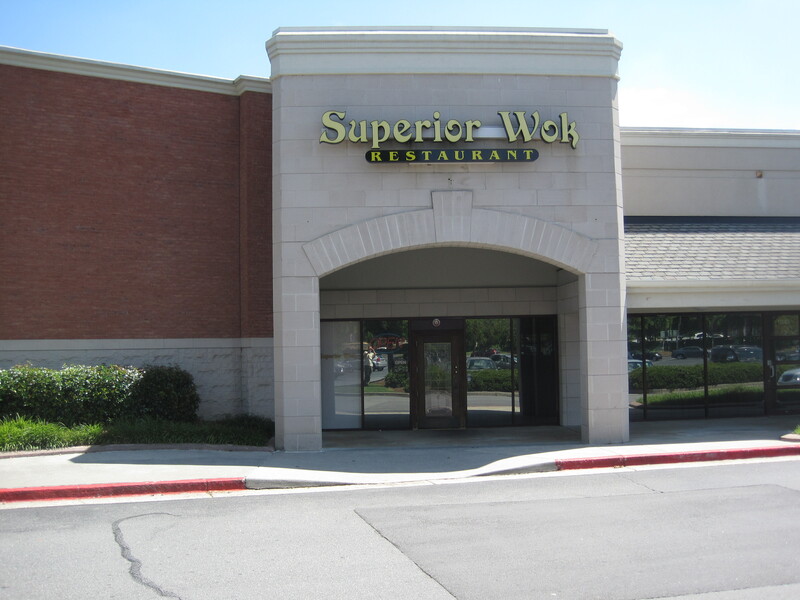 It’s set back; to get to this restaurant, you have to make a sharp 135 degree turn to the right once the feeder meets Buford Highway. 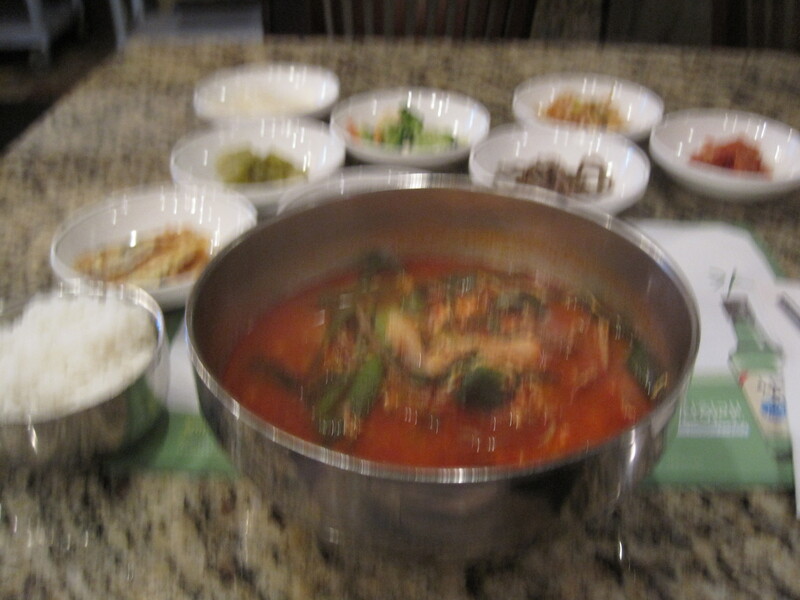 This is the place where BuHi’s third get together was held. As a consequence, this is going to be as much a report on the get together as it is the food. To note, the food is good. But some of the more popular items, such as La Casona’s empanadas, were sampled by others, and my impressions are second hand. The hot Chrysler is BuHi's ride. Who was there? I was the third to arrive, so already at the eatery were the star of the show himself, and an friend, Lena. It was Lena who suggested this spot. “Reader” soon came. I’m calling him “Reader” as he’s a reader of BuHi’s blog, a Tweeter, and has been at every meeting. I can never remember his name. 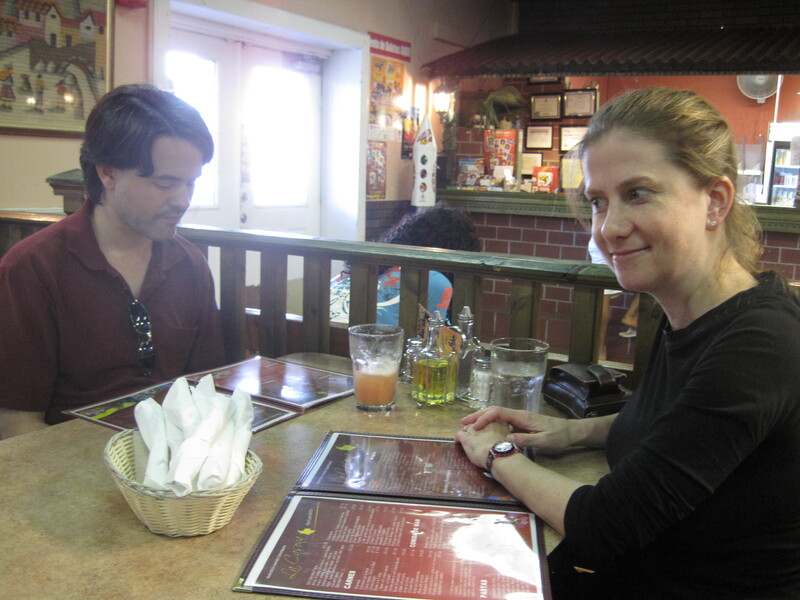 Also present were Jimmy and Julia, oft found on “285 Foodies”. Julia works for a cheese merchant, and spun wonderful stories of dealing with cheeses. Later Mark, Julia’s husband, arrived. Opposite where I sat were a friend of Buhi’s, male. Three other people arrived a bit after Buhi’s friend. 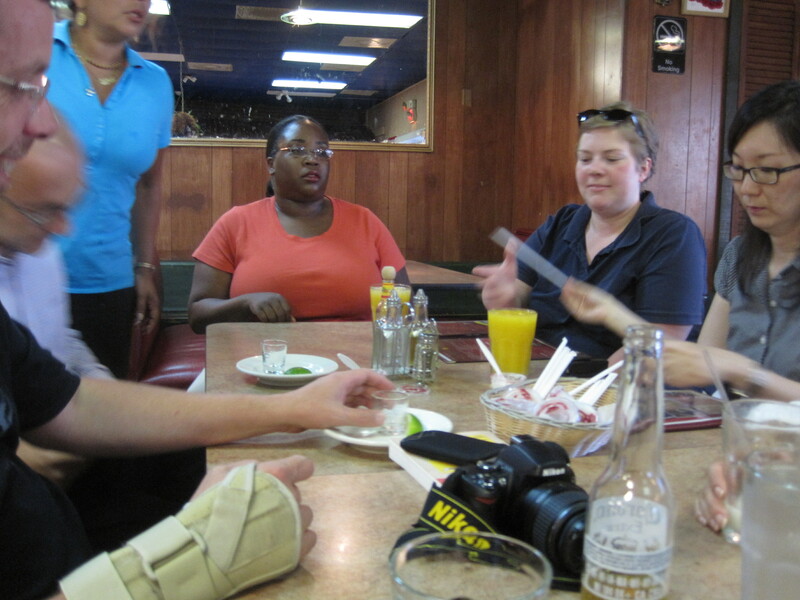 There was the author of Hopeless Foodies, another blogger, whose name and blog escapes me, and a young lady who was a self described Yelper. I’m sorry if I have forgotten names, it was a dizzying place to be and I have hearing issues with my left ear. l to r: Buhi, friend, staff, HF, blogger, and Ms Yelper. In terms of food, first out was a dessert, a mix of custard and sweet. People seemed to like it. I couldn’t sample. 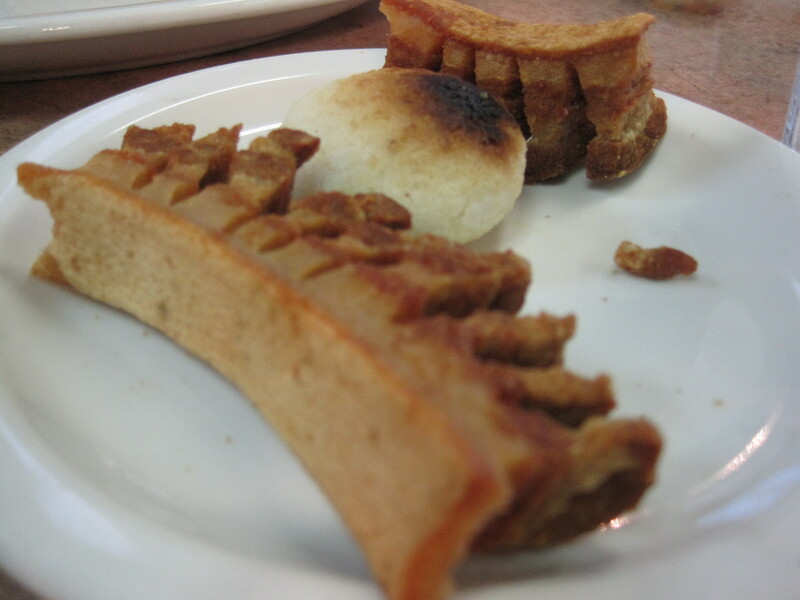 They also had chicharrón (pork rinds), which I could. They’re really not like the kind of pork skins you’ll find at the gas station and quick mart, but more akin to pork belly half sliced into bite sized pieces. Pieces of this taste like thick chewy bacon. Empanadas came as well. I’ve encountered empanadas since Guam. 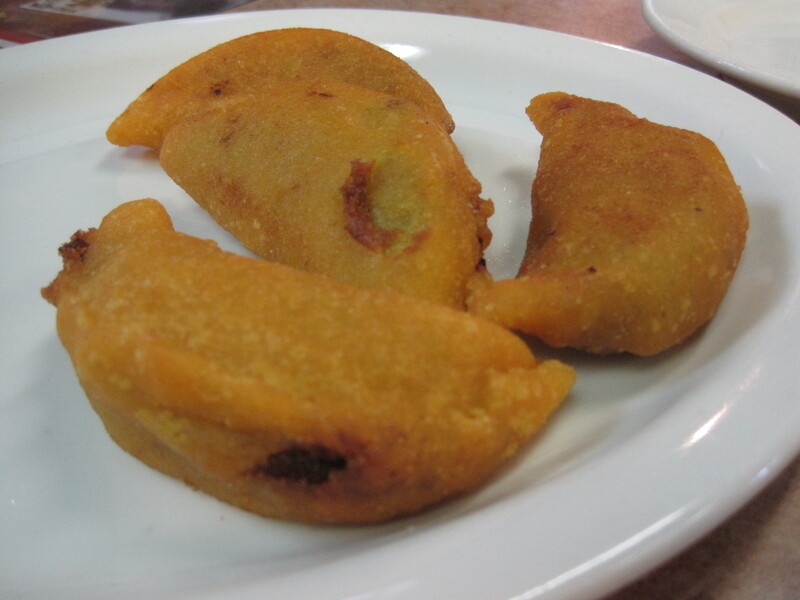 These were clearly hand molded, a bit smaller than the empanadas I’ve seen in Cuban restaurants in this city. They were very popular with this crowd. My dish was the muchacho relleno, a beef tenderloin stuffed. Thing is, it’s stuffed not by slicing the steak along the thin dimension, they stuff it by cutting an ‘O’ shaped hole in the middle of the meat and dropping extra goodies in there. I wasn’t expecting that, and it confused me when the dish arrived. It was good, in a beefy stewy sort of way. 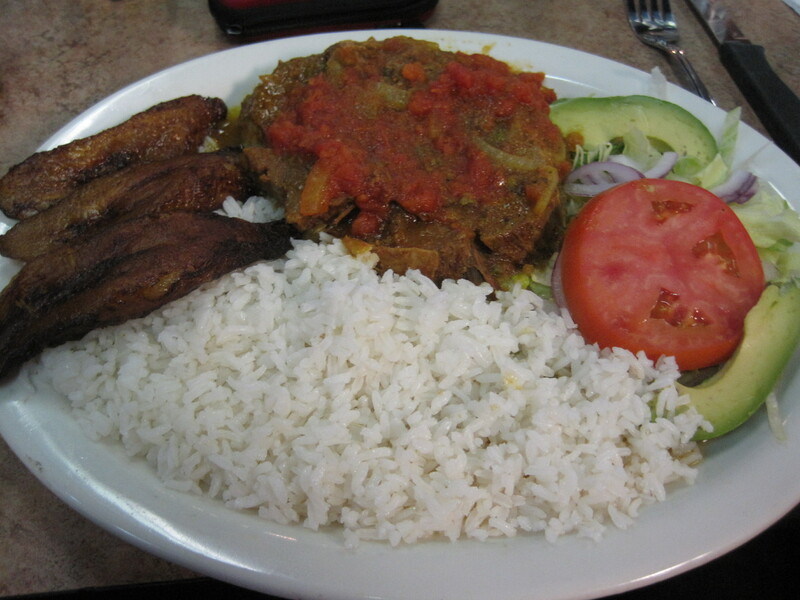 Sides for the meals here typically included rice, and either maduros (sweet plantains), or tostones (green plantains, flattened). This led to a discussion of Mojito’s maduros, which are cooked a bit more than others. Actually, that’s the way my wife likes them, a little toasty. While there, discussions ranged wide and it would be impossible to recount them all. There were discussions of Fung Mei opening on Pleasant Hill (and BuHi made it clear that it was *F*ung Mei), of bad experiences at the old one. 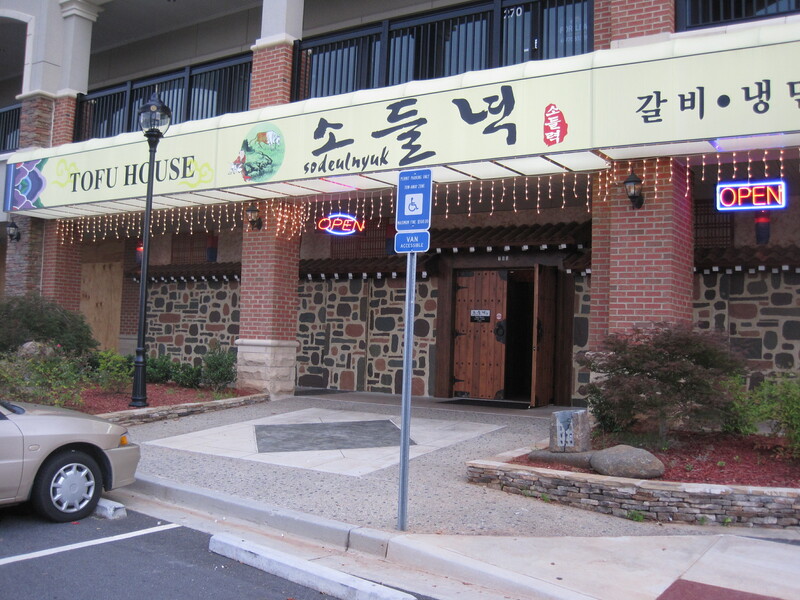 We discussed where the old Fung Mei chef went (now if I could just remember where), where good Chinese could be found on Buford, on the ins and outs of chickens, and why “free range” is essentially meaningless. I kind of wish I had sat a little closer to Hopeless Foodie, as I think she has quite a nice site, and the hearing in my left ear isn’t the best in the world. Before ending this article, I want to step back a little and echo something BuHi said during the dinner. This is that La Casona is going to seem a little different for a typical American, when they enter. But staff here, if given half a chance, will go out of their way to accommodate you. I saw this in their handling of this meal. A lot of attention, a lot of very friendly staff. 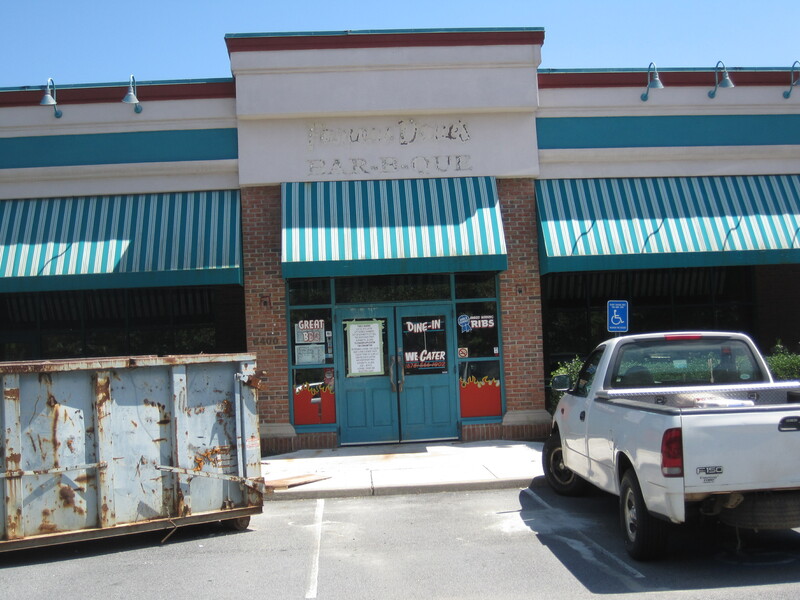 Yes, the food is a little different from the typical Mexican or Cuban eatery, but thematically a lot the same, and the staff is truly helpful. Of course, with Lena, Jimmy and Julia quite conversant in Spanish, it made things perhaps easier for the whole of us. But in short, la Casona handled this affair quite well, and I not only enjoyed the company, I very much enjoyed the presentation and the food. Verdict: Go there. Friendly staff, good food. Highly Recommended. 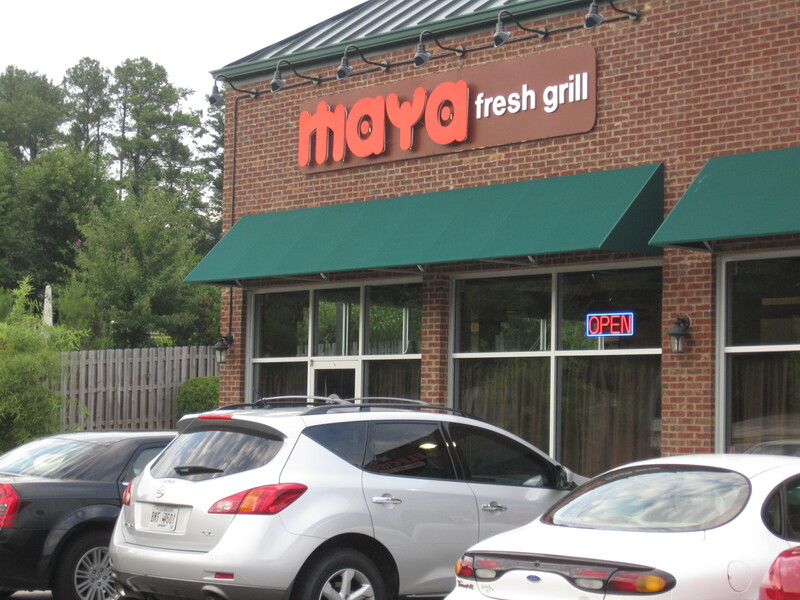 Maya Fresh Grill is a restaurant I’ve spoken of before, because signs of the eatery opening have been around on Pleasant Hill for what has seemed like a year. 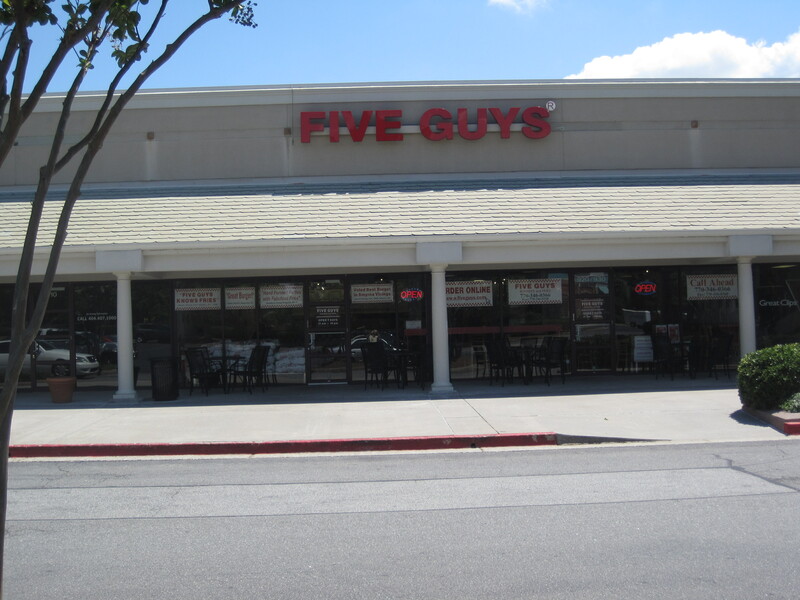 Even now, with the OPEN sign lit in the window, they are so new they don’t even have a menu yet. Guillermo and Jehosaphat are offering a couple items for now, and promising a menu come this Monday. In the meantime, they quite open to suggestions. The iconography of Maya has always been eye catching. This speaks of the pair’s background as graphics designers, working for a variety of businesses in the Atlanta metro area. The inside has art and graphic themes that reflect this interest in their “day job”; the walls have interesting mask art and pretty colors and graphics. But right now the restaurant is still a work in progress. That said, I ate there recently and ended up talking to the pair quite a bit afterwards. They are the classic enthusiast, a sort often encountered in Anthony Bourdain’s Kitchen Confidential. They are charming, pleasant, well spoken, and full of joy at the opening of the eatery. 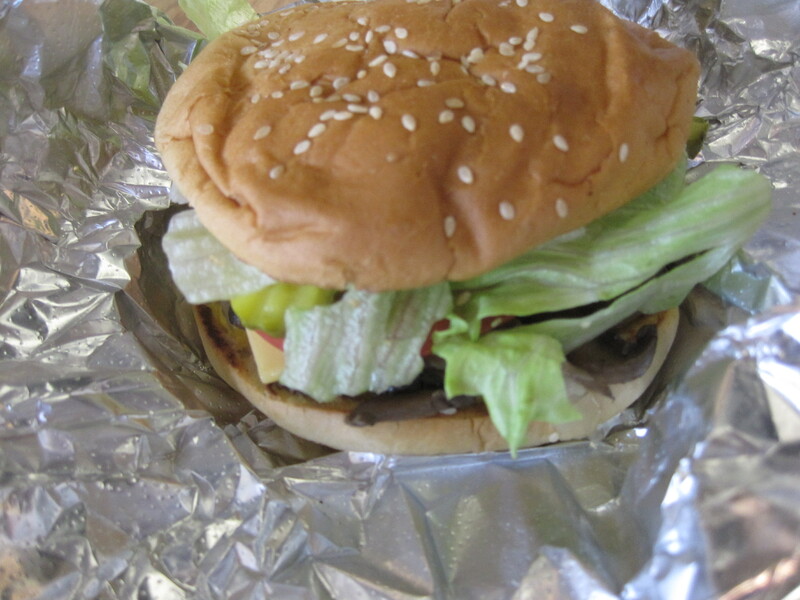 The food: I had a burger, of a kind later described as common where Jehosaphat was raised. Not just beef, there was a slice of ham on the meat, slices of avocado and what looked like a mix of mayo and mustard. 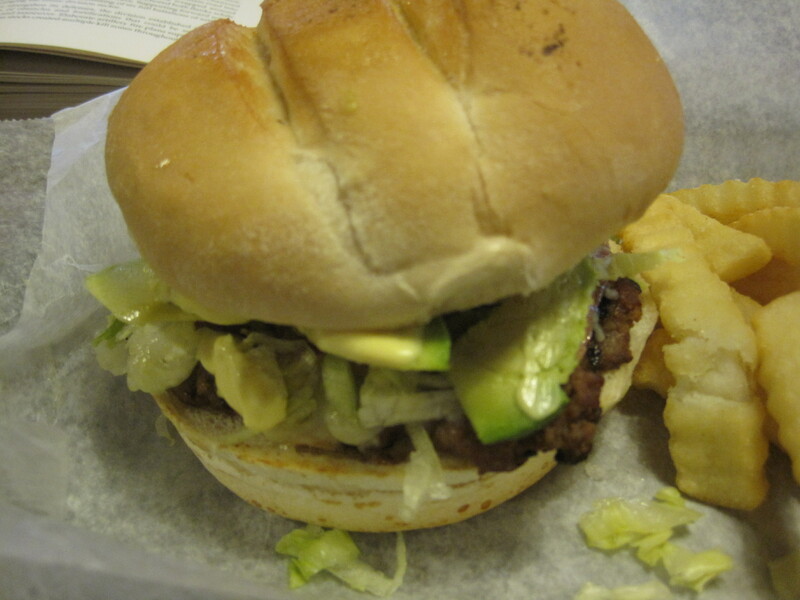 It was good, a thick bun gracing the meat, and the flavor combination reminiscent of milanesa steak. 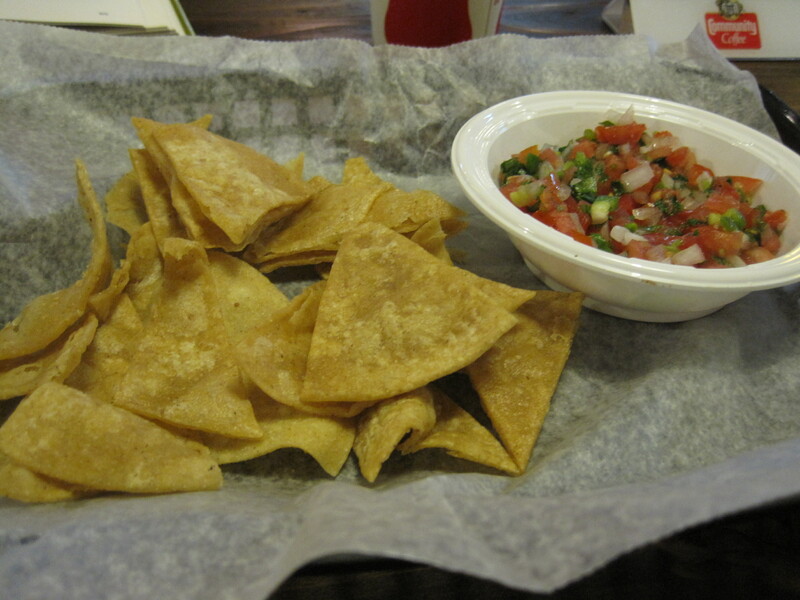 Accompanying the burger were some chips (fried in the store) and a good pico de gallo. Verdict: Promising, but still a work in progress. Drop by if developing eateries are your cup of tea. 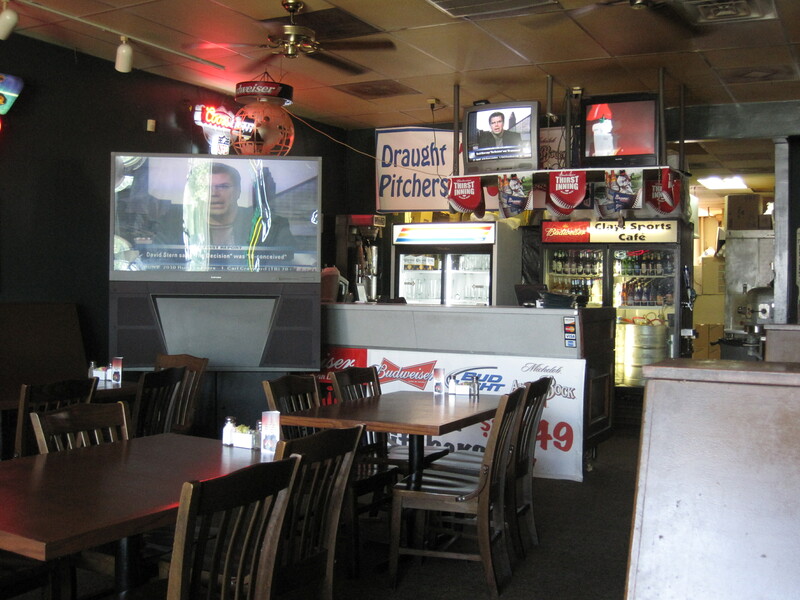 Clay’s Sports Cafe is a small inconspicuous bar, easily missed, on Roswell Road. 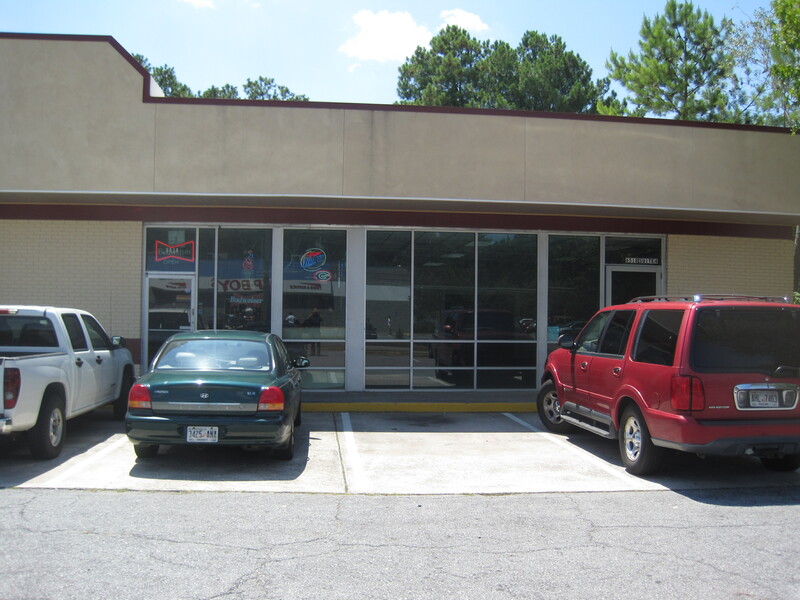 Several booths and a few tables fill a tiny space in a cramped small strip mall along Roswell Road. The quality of the seating is modest. 2-3 televisions dot the area, perhaps 2 people were working when I arrived. Sometimes, though, size doesn’t matter, nor do expensive, trendy ingredients. All that matters are deft culinary skills with the means at hand. Staff here are open and up front about their opinions. When I mentioned I wanted a burger, I was told that it was good, but that it came on a hoagie roll and it would take 20 minutes to prepare. When I tried to order a salad, I was steered to Clay’s “small”. “The large one is huge,” I was told. 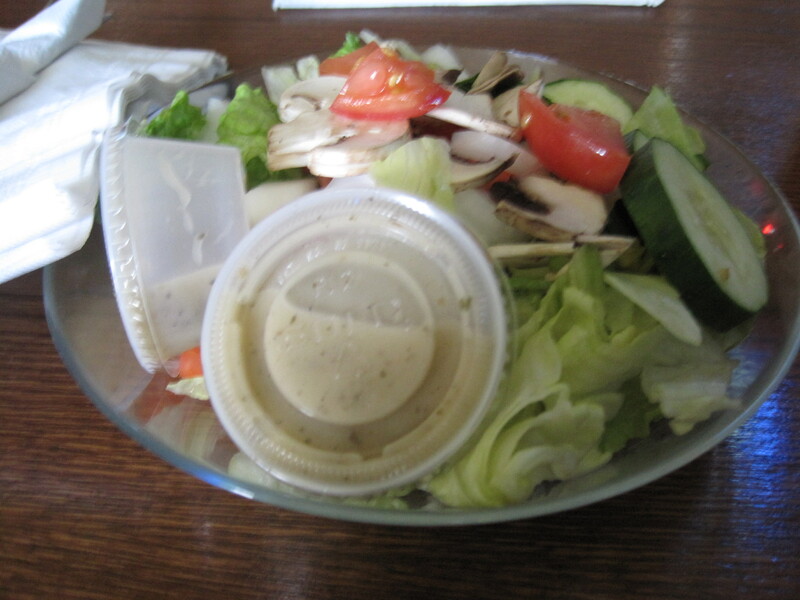 The small salad, which came out quickly, was indeed a generous bed of crunchy romaine. 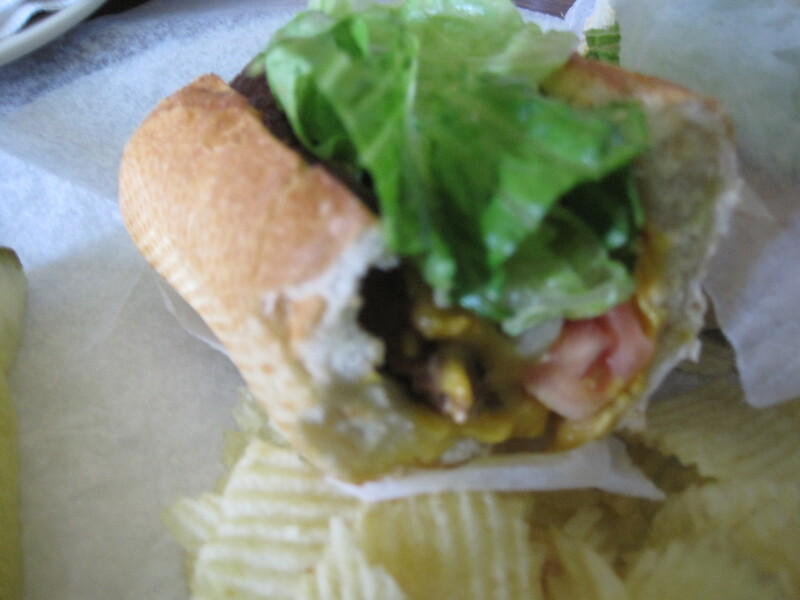 No, hardly the organic baby lettuce of Farm Burger or Yeah!, but crisp and pleasing. The salad made the time to the burger seem very short. The burger looks a little plain, but there is a ton of taste in this modest looking bit of meat. Juicy and flavorful, I ate half of it and doggie bagged the rest. People at work talk about Clay’s, and they do so in terms that are genuinely respectful. In terms of flavor bang for the buck, it’s an exceptional little eatery. Verdict: Plain looking store that serves simple foods made extremely well. Highly recommended.